The Hydraulic Cone Crusher is widely used for secondary and fine crushing in the fields of mining, building materials, metallurgies and so on. The Hydraulic Cone Crusher can crush materials with middle and high hardness such as, ironstone, copper ore, granite, basalt, cobblestone, marble, limestone and so on. The Hydraulic Cone Crusher is popular to be used in high automatic crushing line which has strict requirement for finished products’ shape and ratio. 1. Three kinds of hydraulic protecting parts (protecting oilcan, locking oilcan and hydraulic driving oilcan) not only protect the machinery, but also can deal with troubles without disassembly the parts. 3. The crushing chamber is specially designed according to particles-layer- pressure principle. The special chamber and the suitable rotary speed improve crushing ratio and capacity, so does the cubic product percentage. 4. If something abnormal happens, such as iron is feed into the crushing chamber or there is a jam in the chamber, the machine will lift up the cover and discharging the materials automatically. This eliminates the trouble of stopping the machine to discharge the material by workers, so the maintenance is easier, the cost is lower than spring cone crusher. 5. 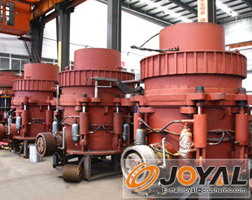 The Hydraulic Cone Crusher is adjusted by hydraulic device and lubricated by diluted oil. The labyrinth seal eliminates the defect of mixture between water and oil in the traditional spring cone crusher. 6. The mantle and bowl liner are made by high manganese steel. The special design of crushing chamber and particles-layer- pressure protection can decrease the abrasion, make the service time 30%-80% longer than traditional cone crusher. sales manager of Shanghai Joyal Mining Machinery Co., Ltd.